Dik Browne ran through the lobby shrieking, his bloody shirt tattered and flapping in his wake. Al Stenzel, art director at Johnstone and Cushing, screamed at Browne as he chased him with a bullwhip. “Don’t you ever bring work like that in here again!” A job-seeking artist looked on, his trembling hands clutching a portfolio case. As he eyed the exit, Browne and Stenzel stumbled back into the room, laughing uproariously. Browne pulled off the mercurochrome-stained shirt and put it away until the next time they would haze a job applicant. Welcome to Johnstone and Cushing. Thomas Arthur Johnstone had long been aware of the business potential of entertainment. In the early 1920s, he had a chance meeting with Chico Marx when the Marx Brothers’ careers had seemed to hit bottom. Johnstone listened as Marx explained the brothers’ plight, which included no work and no money. He contacted his older brother, Will, and the two hastily assembled a show that combined old Marx Brothers vaudeville routines, new material written by Will and new music composed by Tom. The cobbled-together I’ll Say She Is! opened in some smaller Pennsylvania venues—backwater hamlets such as Canarsie and Allentown—before it came to Philadelphia in June 1923, where it was an instant hit. A year later, the show hit Broadway, and the Marx Brothers suddenly found themselves at the beginning of their most successful years. Johnstone learned that Joseph Pulitzer’s New York World was looking for a manager for its syndication company, the Press Publishing Co., and he won the job. During the 1920s, the Chicago Art Institute alumnus began working with the paper’s cartoonists every day, and brother Will drew editorial cartoons for the paper, popularizing the image of the overburdened, barrel-clad taxpayer. Born March 3, 1888, in Evanston, Illinois, Johnstone became friendly with many of the World‘s cartoonists, but the association was cut short in 1930, when Joseph Pulitzer II sold the struggling paper to the Scripps-Howard organization. Scripps-Howard combined its new acquisition with the Evening Telegram to form the World-Telegram, in the process putting most of the World employees, including Tom Johnstone, out of work. But he wasn’t idle for long—Johnstone would soon have an idea. Dr. George Gallup’s first research study, released in 1931, analyzed the preferences of newspaper readers in Des Moines, Iowa. His report produced two startling conclusions concerning the Sunday comics: The least popular comic strip was better read than the main news story, and adults as well as children were avid readers of the Sunday comics section, refuting the assumption that the Sunday comics section was largely the purview of young people. Gallup’s revelation grabbed the attention of advertisers, who saw an opportunity to put their messages before a large and enthusiastic audience, and he expanded his research to 14 newspapers and interviews with around 40,000 newspaper readers. His subsequent studies showed that a popular comic strip had the second-highest readership of anything in the paper, behind the picture page. The meeting’s minutes further acknowledge the inevitability of the industry’s acceptance of cartooning as an advertising medium: “I think advertising must admit that it will have to make use of a modified form of comic strip. Only by sponsoring a comic strip can it probably take full advantage of the strip’s popularity,” Jessup said. Certainly, the unrelenting depression of the early 1930s served as a powerful incentive to adopt some humility about making a comics-style sales pitch. With agency commissions suffering in an ailing economy, Gallup’s research emboldened advertisers to create cartoon-style ads that would be published in Sunday comics sections. “Suburban Joe” advertisement for Grape-Nuts cereal. Also in 1931, Roy Whittier created “Little Alby” to sell Grape Nuts. General Foods, the maker of Grape Nuts, reported a dramatic surge in the cereal’s sales, which had been steadily declining for years. The trickle of comic-strip advertising became a flood, and by 1933 advertising in nationally syndicated Sunday comics sections cost more than a page in such stalwart magazines as The Saturday Evening Post. Raymond Rubicam of Young & Rubicam was one of the early champions of comics-style advertising (or “sequence-picture copy,” as he termed it). Rubicam’s chief advertising experience was as a copywriter, and he saw the narrative quality of the comic-strip form as an effective marketing tool. Young & Rubicam repeated the success of the “Little Alby” campaign with another Grape-Nuts cartoon-style campaign starring baseball pitcher Dizzy Dean. The agency was also responsible for Albert Dorne’s creation of the Mr. Coffee Nerves campaign, which increased sales of the General Foods coffee substitute, Postum. Success bred imitation, and the cartoon ad was suddenly an advertising staple. Following his layoff from the World, Johnstone encountered some lean times, as many did during the Depression. “My father bounced around for several years, just trying to get by. He was hard pressed to find money to pay the man who put a new roof on our house,” said his son, also named Thomas Arthur Johnstone. Johnstone, 87 (and known to friends and family as Tim), said his father came home one day after having talked to someone about the economic opportunities in cartoon-style advertising, and he saw the chance to capitalize on his relationships with cartoonists. In the early 1930s he founded the Thomas A. Johnstone Comic-Art Studios and began visiting all the major advertising agencies, including J. Walter Thompson, N.W. Ayer and Young & Rubicam. “My father sold a few of the agencies on the idea, and that was the beginning for the company,” he said. The elder Johnstone—whom his employees fondly called “the Old Man”—groomed a stable of cartoonists capable of producing a wide range of advertising work. New York had long been the nexus of the cartooning world; it was the cradle of the newspaper strip, the magazine gag and the relatively new but fast-growing comic-book industry. With the city’s monopoly on talent, Johnstone could tap the industry’s best. By 1935, Johnstone’s studio was producing work that promoted Lux Soap, Chase & Sanborn Coffee, Nestle’s Chocolate, Shell Gasoline, Ivory Soap and Fleischmann’s Yeast, among others. Some of the company’s campaigns won advertising industry awards in 1935, conferring credibility on the company and allowing it to accumulate more accounts. Building his new business didn’t dampen Johnstone’s love of Broadway, and he remained involved with the Great White Way. In 1930, around the same time that the World let him go, he was involved with a resurrected production of Artists and Models, a show that had been performed periodically on Broadway since 1923. One of the investors in the show was Samuel Dewey Cushing, and he and Johnstone struck up a friendship. Sam Cushing was the civil engineer who invented the fuse for the tracer bullet, which allowed American troops in World War I to aim weaponry with greater accuracy; his innovation was credited with expediting the Allied victory. He also invented a semaphore system that was adopted as the nationwide standard for the railroad system. (Vestiges of the system endure in today’s railroad network.) These and other patents he held generated a sizable personal fortune, although much of it was lost by unprofitable investments in European bonds. Nevertheless, Cushing’s only son, John Dewey Cushing, born March 19, 1908, had a trust fund that afforded him an income, but not one so large that he didn’t need to work. Sam knew that Tom Johnstone was enjoying some success with his art agency, so in 1936 he suggested that his son Jack, as he was called, see Johnstone about a job. Johnstone made Jack a partner, and Johnstone and Cushing was born. Creig Flessel started drawing comic books in 1935, when he was 23. No one was getting rich drawing comic books, so he sought to supplement his income with advertising illustration. “In 1936, I went to J. Walter Thompson looking for work, because they had been doing a lot of comic ads,” he said. “All the secretaries there knew Tom Johnstone, and one of them told me I should go to Johnstone and Cushing.” Flessel went to the Johnstone and Cushing offices, then in the Commerce Building at 145 East 44th Street, and he took the elevator to the thirty-sixth floor penthouse suite that housed the offices. Flessel was in awe of the staff, which was a cartooning Who’s Who: “There was Albert Dorne, Austin Briggs, Bill Sakren, Joe King, Stan Randall, Paul Fung, Milt Gross, Milt Caniff, Lou Fine, Stan Drake, Noel Sickles, Ralston Jones, Katie Osann…everybody went through there at some point. The talent level was just intimidating,” Flessel said. The company was able to hire the best talent because the advertising industy’s demand for comics-style advertising was great, and the agencies paid an art service like Johnstone and Cushing accordingly. As the company assembled a staff, they hired Jack Frost and Irving Watanabe for balloon lettering, Floyd Bonar for logo lettering and Eliot Batchelder for coloring and mechanicals production. “They had a lot of work and they needed artists,” Flessel said, “but they felt my work was a little crude, so they recommended me to John Striebel.” Striebel needed an assistant to help produce his Dixie Dugan strip, so he hired Flessel. While there, he also assisted Streibel in drawing advertisements featuring Vic and Sade, characters from Paul Rhymer’s humorous radio show who appeared in ads as avid consumers of Farina Wheat cereal. Noel Sickles and Milton Caniff, already collaborating on other comic-strip projects, were two of several creators—including Lou Fine and Albert Dorne—who produced the Mr. Coffee Nerves ad series for General Foods. The ads featured the wraithlike Mr. Coffee Nerves, whose attempts to use caffeine to disrupt people’s lives were always thwarted through their consumption of Postum, the caffeine-free coffee substitute. Flessel said that Sickles chafed under the restrictions of doing ad work. “He wanted to do his own thing, but the art directors insisted they were boss,” he said. “You had to bend a little.” Mr. Coffee Nerves was one of several accounts that originated outside Johnstone and Cushing but which later settled there as the company’s reputation grew. Like Flessel, Tom Scheuer apprenticed before he got work from Johnstone and Cushing. In 1950, Scheuer came to New York from Chicago in search of work as an artist, and he began assisting Leonard Starr on his comics work. A stint in Korea later, Scheuer came back to New York to find that Starr had begun producing advertising work at Johnstone and Cushing. “All of a sudden, instead of getting $35 a page from a comic-book house, you’re getting $300 a page from Johnstone and Cushing,” Scheuer said. Starr advised Scheuer to become skilled at drawing “pretty girls and handsome men, since that’s what advertisers wanted.” Scheuer had been working for Stan Lee at Marvel Comics, and Scheuer requested that Lee assign him to Marvel’s romance titles, since that would teach him how to draw attractive people. In 1954, he brought samples of his Marvel work to Johnstone and Cushing, and they began assigning him work. Scheuer continued to work for Johnstone and Cushing into the early 1960s, originating the Chip Martin, College Reporter ad campaign for AT&T, but he became creatively dissatisfied with cartooning. “I saw all these guys who didn’t seem very happy with their lives,” he said. He was interested in filmmaking, so he devoted his energies to storyboarding and soon became New York’s highest-paid storyboard artist. He attended film school and began directing. He moved to Hollywood and made another change: He decided to go along with the mispronunciation of his name that he’d heard his whole life, so he changed “Scheuer” to “Sawyer.” Tom Sawyer, as he’s been known since 1977, worked on numerous television shows and was the head writer of Murder, She Wrote for the program’s final four-and-a-half years. Last year saw the publication of his first novel, The Sixteenth Man. When America’s enlisted men returned home at the end of World War II, the talent pool from which Johnstone and Cushing could draw expanded. One of Tom Johnstone’s first hires was his son Tim, who—like his father—began visiting the ad agencies. “If you see a groove in the sidewalk along Madison Avenue, I made it from walking up and down it so many times,” Tim Johnstone said. Around this time, Stenzel, just out of the Coast Guard, joined the company as art director. Fox also joined Johnstone and Cushing after the war, where he had worked on the Stars and Stripes newspaper. Wexler once fell prey to a nationally broadcast practical joke originating at the Johnstone and Cushing offices. Jack Cushing was a friendly acquaintance of Allen Funt, whose Candid Microphone was broadcast on the ABC radio network and Funt convinced Cushing to allow him to have some fun at a cartoonist’s expense. One day, Wexler brought in a completed assignment, and Funt posed as the client. He took out a pen and began making suggestions and corrections directly on Wexler’s original art. Wexler’s ensuing outcry—a throaty mix of rage and disbelief—afforded Funt the audible reaction that radio required. “We had to tell him it was a joke right away, because Wex was about to hit him,” Fox chuckled. Wexler was, of course, paid for the defaced artwork. At his own studio, Wexler shared space with Howard Nostrand, who was working on the Bat Masterson strip with an eager-to-learn assistant named Neal Adams. “Elmer was God to me,” Adams said. “He was doing comics for advertisers! I could barely get work from Archie, and I couldn’t get my foot in the door at DC or Timely, and here’s this guy getting $700 a page—incredible! He was also doing ads for Viceroy cigarettes, and while tobacco advertising is anathema to some people today, back then it was incredibly prestigious.” Adams put together some samples to get work at Johnstone and Cushing, but they doubted that the teenage Adams actually produced the samples. Wexler vouched for their authenticity, so Adams took a drawing table at Johnstone and Cushing in 1959. Like Wexler, Dik Browne sought work at Johnstone and Cushing after the war. In a 1983 interview, Browne talked about his introduction to the idiosyncratic Johnstone and Cushing corporate culture. When Browne walked into the reception area, Tom Johnstone was banging out a ragtime tune on the piano he kept in his office. Through his receptionist, Johnstone asked Browne if he could play the piano. Browne replied to the woman that he couldn’t, at which point Johnstone told him to leave. Browne was about to exit the building when Cushing stopped him, told him to disregard what his partner had said and asked to see his samples. Browne, however, had come without any samples of his work, so he went home after enthusiastically describing his style to Cushing. Browne was amazed when his phone rang later that Friday evening—it was Al Stenzel, calling to ask Browne to come back to the office to pick up an assignment. That began an association with Johnstone and Cushing that lasted into the 1960s. Browne described the Johnstone and Cushing years as some of the happiest of his career. “I have more funny stories about Johnstone and Cushing than about any other part of my life,” he said in the interview. “That was the funniest place, we were all young and gay, and none of us were making a great deal of money at one time, and then some of us made a great deal of money.” He recalled countless hours spent pitching pennies with his fellow cartoonists. One day, repairmen came in and tore up the section of the floor where they pitched pennies, because the tenant beneath them had mistakenly thought the plumbing system was making the pinging noise. Browne was one of the company’s most prolific artists. (He was renowned for his ability to draw without looking down, the better to carry on conversations.) Among many assignments, he created the Chiquita Banana symbol and gave the Campbell’s Soup kids, originally done in 1905 by Grace Drayton, a contemporary look. He also created ads for Mounds candy bars, one of which caught the attention of Beetle Bailey creator Mort Walker. At the same time that Walker was taking note of Browne, King Features Syndicate comics editor Sylvan Byck saw Browne’s work on The Tracy Twins in Boy’s Life magazine, for which Johnstone and Cushing produced the comics section. In 1953, Byck and Walker were seeking an artist to draw Hi and Lois, a new strip that Walker had sold to King Features. Separately exposed to Browne’s cartooning, both Walker and Byck placed him at the top of their list of artist candidates. When Byck called Browne at the Johnstone and Cushing offices to discuss the opportunity, Browne initially through Drake was playing a prank, but eventually he realized the call was from Byck and was legitimate. Browne attempted to maintain his Johnstone and Cushing workload while drawing Hi and Lois, but he soon reduced his advertising work to focus on his strip. In 1973 he created Hagar the Horrible and began the most successful phase of his career. But according to his son, Chris, Browne always recalled the Johnstone and Cushing years fondly. “He always talked about what a fun place it was,” Browne said. Change came to the advertising industry in the 1950s. Johnstone and Cushing still paid frequent visits to the advertising agencies that had for many years given them all the work they could handle, but now the business climate was different. Advertising done in a cartoon style was not as popular as it had been, so diversification became necessary. 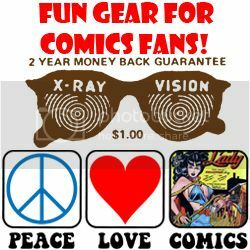 Tim Johnstone said that his father had long talked about introducing a comics section into a national magazine, so the company struck a deal to supply Boy’s Life with a color comics section. Art director Al Stenzel wrote the lion’s share of the material, including The Tracy Twins, Pee Wee Harris, The Space Conquerors and Bible Stories, which were drawn by a variety of Johnstone and Cushing cartoonists. Johnstone said the comics section was a success, boosting the circulation of Boy’s Life substantially. The revenue that the comics section brought in helped offset the cartoon advertising’s moribund business, as did the company’s production in the 1950s of comic books for numerous companies, including Ford Motors, General Motors, Chrysler Corp., B.F. Goodrich, DuPont, Westinghouse, Norelco and General Mills. Johnstone and Cushing cut its overhead during this time by moving to less expensive office space at 292 Madison Avenue and, eventually, at 137 East 57th Street. “We were pulling in our horns then,” Flessel said. By 1955, Fox had stopped working for Johnstone and Cushing on a daily basis. “I missed going in,” he said. “The office was stimulating, because you were associating with the best.” Nevertheless, it was obvious to everyone that the amount of work, once so plentiful, had dwindled. “I was raising kids and paying a mortgage, so it was time to move on,” Fox said. He continued doing occasional jobs for the company, but he didn’t see how Johnstone and Cushing would endure the waning of the comic-strip advertising, its longtime bread and butter. The business took another blow in 1957 when Jack Cushing suffered the first of a series of strokes. According to his son, Samuel Dewey Cushing II, 68, his father was unable to continue in the business. “He was very confused and couldn’t remember things,” he said. Johnstone bought out his old partner, again becoming sole owner of the business he founded. In 1958, Cushing moved from his home in Stamford, Connecticut, to Jupiter, Florida, where he lived until his death on January 20, 1978. Sam Cushing briefly joined the company in 1960 to perform some of his father’s duties. While Johnstone and Cushing attempted to adapt to internal change, the advertising industry was undergoing its own revolution. Although agencies in the 1940s were unsure whether advertising on television would be either effective or profitable, by the 1950s no one doubted that the medium represented the future and held unlimited opportunity; even the prescient Gallup, who had been so accurate about the comics decades earlier, said so. Television’s share of advertising revenues skyrocketed from a minuscule $12.3 million in 1949 to $128 million in 1951. Both Tim Johnstone and Sam Cushing said that television sounded the death knell for cartoon-style advertising. “It became pretty tough trying to interest anyone in spending money on Sunday supplements,” Cushing said. Johnstone was more blunt: “Color television killed our business.” Young & Rubicam, the agency that had given Johnstone and Cushing so much work over the years, was involved in creating the first television commercial to be broadcast in color; the future had arrived.